The Ryedale Anglers' Club was founded in 1846 by a small group of friends to fish for trout on the River Rye. Since its foundation the Club has remained entirely based on the Rye's resident stock of wild brown trout, which makes it a rarity amongst its peers. Today the Club's has 65 members who enjoy fishing one of the most beautiful trout rivers in England. The underlying geology is limestone, which yields clear alkaline water that is ideal for invertebrate life and the many varieties of flies that form a major part of the trout's diet. As a result the trout in the Club's water are plentiful and grow to a substantial size: 3 pounders are regularly caught and 5 pounds is usually bettered at least once per season. The largest recent specimen was over 7 pounds. There is also a good population of grayling throughout the water. Ryedale is flanked on one side by the North York Moors and on the other by the Howardian Hills. The river flows through idyllic scenery including the landscaped beauty of Duncombe Park. 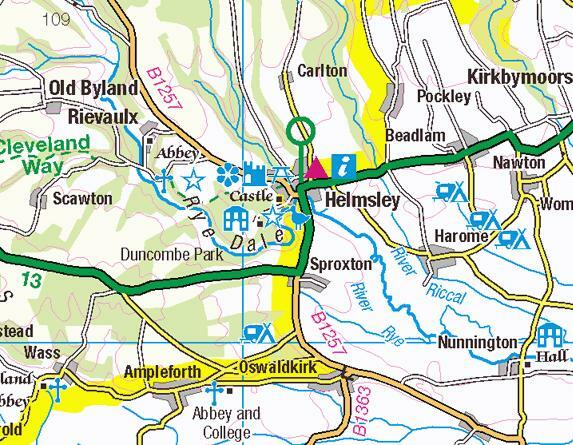 The Club's water runs from Rievaulx Abbey, through Helmsley and on to beyond Harome. Only at Helmsley is there habitation adjacent to the river: otherwise the Club's members enjoy fishing in total rural tranquility that they share only with the abundant birds and wildlife. The Club employs a full-time river keeper, Jim Gurling, who manages the fishing, maintains the banks and access, and assists members as required. Throughout we strive to strike a balance between fishing access and natural beauty. Fishing the Club's water is solely by annual subscription membership and daily booking of beats. With 60 members there is a continuous ebb and flow of retirement and joining. As a result our waiting list is short and we welcome applications from those who live close enough to Ryedale to be able to enjoy the unique opportunity that the Club offers the enthusiastic trout angler. You will find further information on the Membership page.